Iron can be a real headache if we don’t know how to clean it after each use. 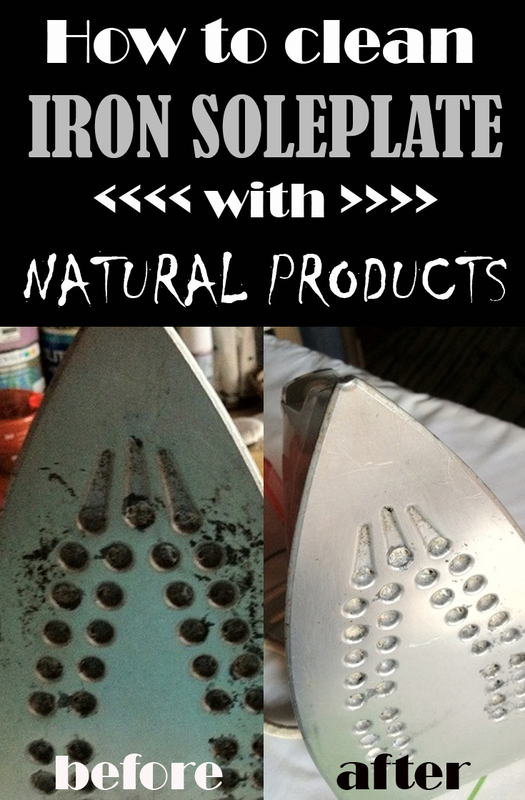 Learn how to clean your iron soleplate with natural products. Prepare a solution of water and vinegar (equal parts). Fill the iron tank to 1/3 of its capacity and turn the steam on for 5-10 minutes or until all of the liquid has evaporated. It’s better to do this procedure as close to an open window to avoid inhaling vinegar fumes and impurities. Once the tank is empty, fill it to full capacity with fresh water (distilled) and turn on the iron to remove any mineral deposits or remaining vinegar inside it. If you want to clean the soleplate, all you have to do is to soak a cloth in vinegar, turn on the iron and start to rub it over the cloth. You can use a cotton swab to clean out the steam holes. This method is the same with the one above, but if you want to clean the soleplate you need to add 2 tablespoons of baking soda over the cloth soaked in vinegar. If you don’t have baking soda, you can replace it with salt. It works fine as well. Put a small amount of toothpaste (not gel) on a cloth and rub the affected areas (make sure the iron is unplugged! ), then wipe the soleplate. To be sure you have removed any toothpaste trace, including the steam holes, use the vinegar method.